Pterostilbene (terro-still-bean) is a Stilbenoid, an antioxidant produced by plants to protect themselves against viral, bacterial, fungal attack and excessive sunlight much like another in the same family: Resveratrol. 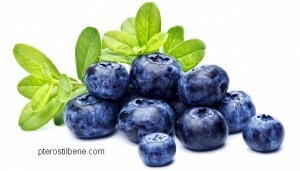 Pterostilbene is most abundant in Blueberries. Reservatrol has been known for being in the skins of red grapes as an active ingredient, thought to be responsible for the French Paradox : The french have heart healthy and healthier lives than most on their type of diet (as whole, they eat an inflammatory, artery clogging, pro diabetes and pro cancer diet. But thanks to their love of red wine and the Resveratrol it contains, they are not prone to these diseases). Reservatrol has also been identified for other properties, including anti-diabetic, anti-inflammatory, and anti-cancer. It’s more easily absorbed through the stomach lining and cell membranes and stays in one’s system longer, giving it similar, but more powerful effects. Researchers believe pterostilbene and resveratrol work through same pathways biologically. Because of this, pterostilbene and resveratrol supplements are now being offered by several supplement companies. Pterostilbene has an uncanny ability to treat many diseases by changing abnormal cellular metabolic pathways to best correct whatever problem is being faced by diseased, aging cells. In other words what it does varies depending on how cells have deviated from normal, healthy metabolic pathways. It up- or downregulates these pathways based on the nature of the disease or aging process taking place in ailing cells. Clofibrate – used to lower cholesterol and triglyceride levels. Metformin – used to treat type 2 diabetes. FOLFOX – a chemotherapy regimen for the treatment of colorectal cancer. Calorie Restriction is presently the de-facto youth extension strategy and causes the expression of a large number of genes that keeps inflammation and the inflammation related diseases of old age, like atherosclerosis and cognitive decline, at a minimum. Pterostilbene has the same effect on most of these same genes. Combined with Resveratrol; It covers just about all of the genes positively affected by Calorie Restriction and then some, reducing fat accumulation in the body and liver by reducing lipogenesis in adipose (fat) tissue and elevated fatty acid oxidation in the liver etc. Keeping DNA in good repair is essential to longevity. DNA damage due to oxidation dropped by 18% after one large dose of Pterostilbene rich Blueberries in volunteers. DNA damage from sun exposure is also reduced. Blueberry extracts (pterostilbene rich) upregulated Natural Killer (NK) Cells, while downregulating proinflammatory Nuclear Factor kappa-beta (NFk-b) expression. NK Cells identify and destroy any abnormal cells such as virus infected and pre-cancerous cells. It inhibits infectious particles from being assembled and secreted by the Hepatitis C virus. Candida Albicans is a particularly nasty fungus as it has the ability to form antibiotic resistant biofilms and is a NAD+ auxotroph this means it decreases NAD+ which is essential for the expression of youth extending SIRT genes and energy levels in general. Pterostilbene downregulates the expression of Ras, cAMP and related genes in Candida that are involved in the forming of its protective biofilm so that the immune system can get to and fight any Candida infections. Currently Pterostilbene has been found to be effective at reducing breast, colon, esophageal, liver, pancreatic, prostate, stomach, cancers to varying degrees. • Induces apoptosis (cell death) in some types of cancers! While Pterostilbene increase oxidative stress in many cancers, it has the opposite effect in in arteries and veins where it decreases oxidative stress; reducing the death of the Vascular endothelial cells that line the entire circulatory system. Pterostilbene is comparable to the drug Metformin in its ability to improve insulin sensitivity and reduce blood glucose levels via to the metabolic regulation of Diabetes. Which means it’s better than drugs such as Ciprofibrate at lowering the high lipid (fat) and cholesterol levels in the bloodstream that cause atherosclerosis and blocked arteries. High lipid and cholesterol, along with high blood sugar, are associated with Dementia, Liver Disease and the general decline of the circulatory system that should be keeping bodies well nourished, oxygenated, energetic and young. Pterostilbene also has the remarkable ability to protect red blood cells against bacteria, parasites and drugs that would normally kill them and synergises with Resveratrol to protect them from oxidative stress. Pterostilbene showed a remarkable ability to reverse cognitive deficits by reducing the oxidation and inflammation that stress brain cells and are a major cause of Alzheimer’s disease and age related cognitive decline. It also increases the levels of Insulin-like Growth Factor 1 (IGF-1) and Dopamine in the brain. IGF-1 is integral to the growth of blood vessels and neurons in the Hippocampus, while Dopamine is integral to learning and memory. In the most recent months, pterostilbene has quickly become a promising natural compound in the nutrition and health supplement marketplace. There are several reasons for this sudden increase in the popularity of the product and the supplements within the market. First, there have been a number of scientific studies published on the topic since 2004. As more promising studies are released, it promotes scientists to release even more to show how popular a product is and what the research is that they have experience with. Next, enhanced technology allows pterostilbene to be produced at lower costs and in larger quantities. Pterostilbene was isolated first from a red sandalwood tree which is endangered and found only in southern India. Due to the endangered status of the tree (and other species containing pterostilbene) and the extraction process (it is labor intensive and expensive), obtain large quantities of the pterostilbene from this source is not practical. Luckily, another source also contain pterostilbene. The main one from where it is today extracted / purified is blueberries. Technologies such as fermentation can help to increase the purity, however most commecial form are synthetic (such the one from Chromadex) in order to be manufactured low costs and in larger quantities. The technologies also encourage several endangered species to be protected. As more positive studies increase and more inexpensive and high quality pterostilbene is produced, more supplements are sold in stores and online, allowing more people to take advantage of the many health benefits. 1: Pterostilbene, a dimethyl ether derivative of resveratrol, reduces fat accumulation in rats fed an obesogenic diet. J Agric Food Chem. 2014 Aug 20;62(33):8371-8. doi: 10.1021/jf501318b. Epub 2014 Aug 8. 3: Pterostilbene and cancer: current review. McCormack D, et al. J Surg Res. 2012. 4: Cellular and behavioral effects of stilbene resveratrol analogues: implications for reducing the deleterious effects of aging. J Agric Food Chem. 2008 Nov 26;56(22):10544-51. doi: 10.1021/jf802279h. 5: Pterostilbene, a natural dimethylated analog of resveratrol, inhibits rat aortic vascular smooth muscle cell proliferation by blocking Akt-dependent pathway. Vascul Pharmacol. 2010 Jul-Aug;53(1-2):61-7. doi: 10.1016/j.vph.2010.04.001. Epub 2010 Apr 14. 6: Protective effect of Pterostilbene against free radical mediated oxidative damage. BMC Complement Altern Med. 2013; 13: 238. 10: Pterostilbene as a potential novel telomerase inhibitor: molecular docking studies and its in vitro evaluation. Curr Pharm Biotechnol. 2014;14(12):1027-35. 11: Low-dose pterostilbene, but not resveratrol, is a potent neuromodulator in aging and Alzheimer’s disease. Neurobiol Aging. 2012 Sep;33(9):2062-71. doi: 10.1016/j.neurobiolaging.2011.08.015. Epub 2011 Oct 7. 13: Protective effect of Pterostilbene against free radical mediated oxidative damage. BMC Complement Altern Med. 2013; 13: 238. 16: In vitro and in vivo activities of pterostilbene against Candida albicans biofilms; Antimicrob Agents Chemother. 2014;58(4):2344-55. doi: 10.1128/AAC.01583-13. Epub 2014 Feb 10. 18: Stilbene compounds: from the grapevine to wine. Drugs Exp Clin Res. 1999;25(2-3):57-63. .23: Pterostilbene, a bioactive component of blueberries, suppresses the generation of breast cancer stem cells within tumor microenvironment and metastasis via modulating NF-κB/microRNA 448 circuit. Mol Nutr Food Res. 2013 Jul;57(7):1123-34. doi: 10.1002/mnfr.201200549. Epub 2013 Mar 15. 26: From French Paradox to cancer treatment: anti-cancer activities and mechanisms of resveratrol. Anticancer Agents Med Chem. 2014;14(6):806-25. 28: Gene expression profiles induced by cancer chemopreventive isothiocyanate sulforaphane in the liver of C57BL/6J mice and C57BL/6J/Nrf2 (-/-) mice. Cancer Lett. 2006 Nov 18;243(2):170-92. Epub 2006 Mar 3. 30: Antioxidant effect of trans-resveratrol, pterostilbene, quercetin and their combinations in human erythrocytes in vitro. Plant Foods Hum Nutr. 2010 Mar;65(1):57-63. doi: 10.1007/s11130-010-0154-8. I’ve been posting on various pterostilbene related web pages my 2 1/2 month effort to reduce my blood sugar test levels, as well as losing 25 lbs at the same time. I’m within a pound of that 190 lbs.goal. I’m now 74 years 7 months of age. I’ve had diabetes, & heart & vascular issues, as well, for about 16 years. At this point, my blood sugar fast finger-sticks show an average of about 89. Eleven months ago, in a VA medical blood draw, I had an a1C value of 7.9% (180 glucose) throughout the day. Now I’m at 6% (128) through the day. I can attribute this to 1500 mg of slow release metformin,which I’ve been on for about 4 years, bolstered by the intake of something new…pterostilbene, two 50mg caps daily. And adding something of my own… 2oz. of live blueberries with each cap.I add strawberries when the price permits, for more berry bulk. Taking just the cap, research has established a 105 minute bloodstream half-life. With some natural berries, which I eat with a few oz. of low fat cottage cheese, I’m hoping to fool my autonomous digestive tract into seeing a chemical connection between the berries and the processed, but identical pterostilbene from a tree found in southern India. Something is working, because an overall result of taking this stuff has given me a remarkable control over my eating habits. The weight loss of 25 lbs. is giving me the proven benefit of CR, which will likely help in warding off for a while, nasty things like cancer, for at least a few years longer than otherwise. This is, perhaps, effecting my gene expression between the mitochondria and the nucleus in my cells. This control of apatite is critical to start shutting down diabetes. 25 lbs. can taken away the semi-obesity many of us have indulged in to feel more formidable in the eyes of others. Face it, slimness will assist you in health as you age. You don’t need the mass that helped in youth for avoiding confrontation. I was a 200 lb. 6′ 2″ early middle aged guy, now I’m content to be a slimmer older guy and maybe live into my 90s. where can i find suppliers of pterostilbene ? Better to find out about Pt now than never hearing about it all. I can’t wait to get and use it. I’ve been using proteolytic enzymes for about 4 months with some positive effects against inflammation, especially arthritis. Now it seems by the research that I should have been using Pt about 30 years ago. Like I said, I can’t wait to use it and see the results. Thanks for this site. I think it appropriate to update my progress with metformin extended release version that is prescribed to me by the VA, taken with 100 mg of the synthetic USDA version of pterostilbene, which is covered by a U.S. government held patent. To date, I have lost 42 lbs. in 5 months, am able to workout with 8 lb. hand weights, practice some CR, after finger sticks, and have official proof of great A1C values, down in 6 months from 7.9 A1C to 5 A1C. This is after 19 years of obesity (up to 247 lbs.) 20 years ago. I will be 75 in April. Please, any legit investigator who wants to see our (3 person test records) should contact me. We have formed a little group of vets to help ourselves beyond the metformin that the VA gives us…This combination is INDEED working! Several other substances seem to work well with pterostilbene. They all work by influncing the gene expression between the mitochordia and the cell’s nucleus DNA, one is niagen, the precursor to naturally present NAD+. Anotheris the well known stilbenoid, found in wine grapes, that is fairly similar to pterostilbene. Two other substances have been helping our little group of VA medical patients who on there own have tried to prove the results of taking prescriptiom metformin. These is the VA’s main agent to deal with type2 diabtes. All 3 of us have had type 2 for years. In my case 19 years. I have seemingly beaten back the grip of my diabetes. I’ve lost 46 pounds, kept if off for six months since reaching that weight. My hbA1C is now in the middle of the 5 range. It was nearly 8 when I started 11 months ago. If you don’t presently take metformin, look into it with your doctor. My life has been changed beyond anything I’d hope for. I was just approved for left carotid endarterectomy, which will open up the left side of my brain blood supply. Only because of the health recently gain have the VA surgeons agreed to allow this procedure. I’m already now able to do 500 to 600 arm curls a day with ten pounds. All my body chemistry is improved greatly. I hope to gain 7 to 10 years of improved health and vitality, and please note with CRISPR gene intervention, great thing may only be a few years in the futre. My aunt lived to 101 almost, my uncle was a ww1 Canadian flying corp pilot and lived past 97. I intend to outlive their lifespans, with the help of cutting edge medical research. I’m a 75 year old, southern California veteran. Look me up on facebook, & you’ll how healthy I now appear. How does NAD compare to pterostilbene? Is trans-pterostilbene in the current supplements available on the market inferior to certified NAD supplements? NAD+ shouldn’t be used as a supplement.. It is expensive and a waste of money because it cant enter the cell. Instead we can recommend to use precursor such as nicotinic acid (niacin) or niacinamide. The more NAD+, the more pterostilbene could be useful when it comes to its sirt1 activation property. 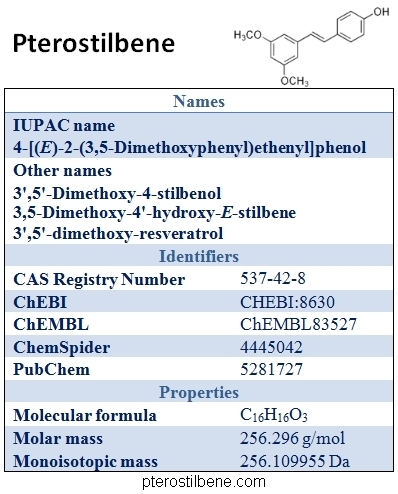 However, keep in mind sirt1 activation is not the only benefits from pterostilbene as you can read on our database. Do you have a list of recommended marketers? Having been in the supplement industry in the 1970’s I know that not all supplements are manufactured under controlled conditions as to potency, etc. Do you have a group of marketers that you can recommend? Thank you for the consideration. In 2012, I had a mild heart attack and saw my internist for the first time in years. A former bodybuilder, I had become a wreck, in six years of non-activity. My AC-1 was in the pre-diabetic range and my cholesterol was very elevated, blood pressure was quite high and I was quite overweight. My internist put me on pterostilbene in addition to drugs for cholesterol, diabetes and blood pressure medication. One year later, he stopped all of the prescription drugs except the beta blocker. All my health indicia were back into the normal range and continue to this day to be taking only the pterostilbene. 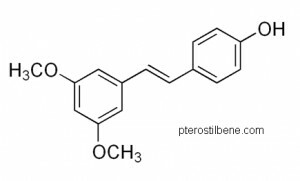 Good blog where can I get Pterostilbene? We highly recomend dynveo.com brand, its pure without fillers. I am almost 68 and have been taking pterostilbene for 7 months. I do not have diabetes and am in good health except for PTSD symptoms. I have noticed a higher mental clarity level and improved short term memory, and have lost about 30 lbs. to around 159 lbs. If the weight loss continues, although it seems to have stabilized, I may need to shop for clothes in the teenagers section! I practice yoga and other exercises but did so before I started taking pterostilbene. I have also been able to reduce by half my dosage of Lexapro and Wellbutrin for depression, though that could be due to other factors. I spread the word to family and friends as much as they can bear. I am Post Polio; PPS is just like aging, only several times faster. What dose should I take? In any case, there’s a flip side; if Pterostilbene has an effect, I’ll see it in days or weeks rather than months or years.